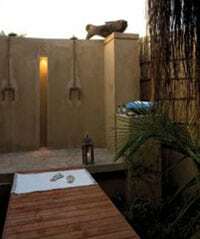 AZURA at Gabriel’s (pic above) is a gorgeous new luxury eco-boutique retreat. The 14 Infinity Beach Villas and Presidential Villa combine modern chic with traditional Mozambican design. The Villas are beautifully furnished with full en-suite indoor bathroom and an outdoor shower. Each Villa has a sundeck with day-bed and “infinity” plunge pool literally right on the beach, but with beautifully landscaped natural tropical gardens for added privacy. 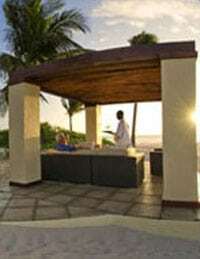 Your personal Gazebo with day bed on the beach is a perfect place to watch the sun set & enjoy the specialty “cocktail-of-the-day”. BENGUERRA LODGE is an intimate resort, with 10 beautifully furnished Casitas, 2 entry level Cabanas, and the ultra-luxurious 2 bedroom Villa. The resort was badly damaged by Cyclone Favio that hit this area in February 2007, and has basically been re-built. The new resort with unique plantation shutters offers the same gracious touch that the Harpers & Queen Travel Awards of 2002 recognised as “The Most Friendly Beach Hideaway.” Each Casita & Cabana has its own sundeck & plunge pool, just a few steps from the beach. MARLIN LODGE is constructed from hardwood, and is an elevated structure on stilts with deck platforms and with wooden walkways connecting the beautifully furnished chalets to the main areas. The 14 Luxury air-conditioned chalets have four-poster beds, and en-suite bathrooms. There are also 3 large suites with lounge area. 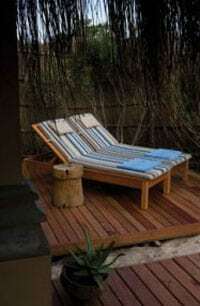 Each chalet has its own balcony with deck chairs or hammocks and short stairway to the beautiful sandy white beach. Activities on Benguerra include scuba diving, snorkelling, gamefishing, fly-fishing, deep-sea fishing, dhow cruises, castaway picnics, horse riding (at Benguerra Lodge), visits to freshwater lakes and various other excursions. All three resorts also offer spa treatments, for that additional pampering. Specials valid until 30 November 2008. Excluded: Visas; National Parks Levy; beverages not specified; Spa treatments; and other activities or excursions not specified, etc.